Injury to the Cranial Cruciate Ligament, CCL, also known as the Anterior Cruciate Ligament or ACL, is one of the most common problems of dogs. 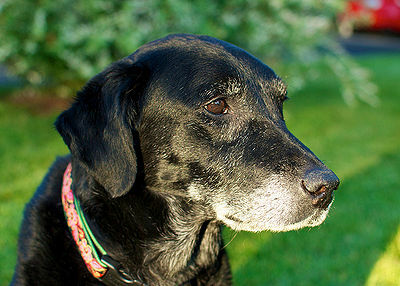 The knee joint becomes painful and can cause lameness and osteoarthritis. The CCL helps to stabilize the knee joint. An active dog puts a lot of stress on the ligament which can cause it to stretch and tear. A partial tear of the ligament can lead to complete rupture if not treated. When the ligament ruptures completely, it causes front to back instability. The medial meniscus, which acts as a cushion, is the cartilage between the femur (thigh bone) and the tibia (shin bone)and is often damaged as well. Large breeds seem to suffer more with this problem. 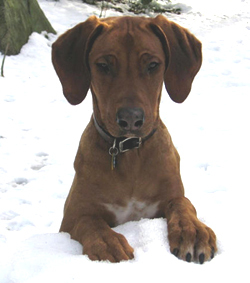 Your vet can manipulate the leg and often can tell if there is a problem. X-rays are recommended to see the extent of arthritis present and to rule out any other disease. There are several different types of treatment for a torn CCL. Pain relievers, weight management and joint supplements such as glucosamine/chondroitin may be prescribed and help the situation. 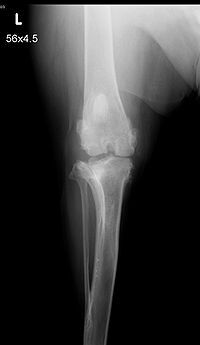 Very often, surgery is prescribed to help stabilize the knee. 1. Lateral Suture Technique (LST) where a synthetic material is used to support and hold the knee joint securely. Other versions of this surgery include bone tunnels, anchors, stronger suture material. 2. Fibular Head Transposition where the fibular bone is moved forward to the top of the tibia and pins and wire are used to hold the position. 3. Fascia Lata Imbrication – (imbrication is the overlapping of edges of 2 layers) an extra-articular (repair outside the joint capsule) used as an adjunct to other methods of stifle stabilization. Lateral Retinacular Imbrication for stablizing the CC deficient stifle generally performed in addition to FLI. These methods do not prevent osteoarthritis from continuing to form. Here are some more advanced techniques. 1. 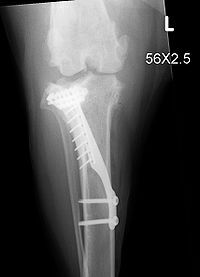 TPLO – Tibial Plateau Leveling Osteotomy – the top of the tibia is cut and rotated a certain amount and fixed. 2. TTA – Tibial Tuberosity Advancement – The TT, the area where the patella (knee cap) tendon is attached to the tibia, is cut and moved forward. Changing the angle of the patellar tendon and tibial plateau stabilizes the stifle. 3. 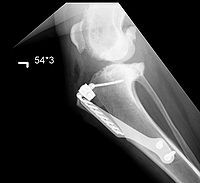 TTO – Triple Tibial Osteotomy – the latest procedure combines TPLO and TTA so that the Tibial Plateau (the slope of the stifle or knee) is rotated and the TT advanced. These newer procedures can be done to repair previous CCL surgeries and chronic CCL tears even if arthritis is present. With TTA and TTO, progression of arthritis is minimized and the knee can return to almost normal function. Post-operative care includes rest, pain relief, antibiotics and continued joint supplements. Your vet will advise you as to massage, acupuncture and exercise as recovery continues. After 6-8 weeks of recuperation, your dog should have follow-up x-rays to be sure the knee is functioning properly. Their are cases where surgery may be avoided. 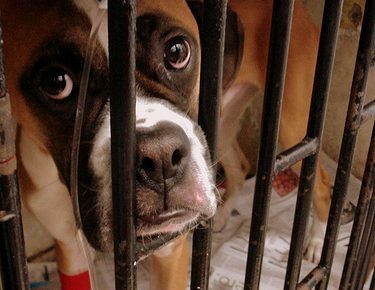 Here are some things you can do to help your dog. Consult your vet to find which therapy can best help your dog. On a personal note, my German Shepherd, Quanah, just had TTA surgery. 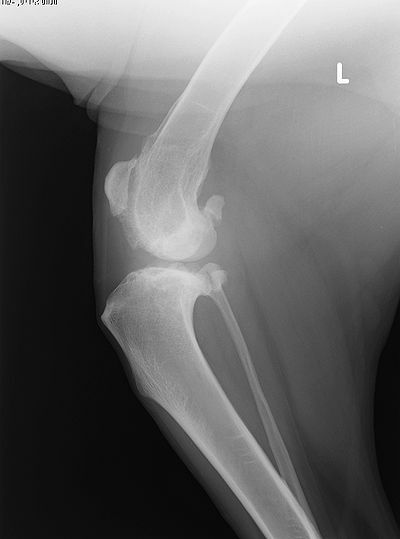 She had been limping and x-rays showed arthritis. We opted for TTA surgery to repair any damage, stabilize the knee and hopefully slow down further progression of arthritis. Surgery was performed on 12/23/09 and I took her home 12/24/09. During surgery, it was discovered that damage was extensive. Her medial meniscus was badly torn and could not be saved. Arthritis was also extensive and severe. At present, 12/31/09, recovery is going smoothly. She was prescribed antibiotics for 10 days and I continue to give her a glucosamine/chondroitin supplement. I will keep you updated on Quanah’s recovery. Sunday, 1/3/10, Dr. Doni, Quanah’s vet, came to remove the stitches. It was discovered that Quanah had removed most of them herself. The area of surgery is still hot, but Quanah’s temperature was normal. The wound is healing nicely. She still does not put a lot of pressure on the foot so we are continuing with Norocarp, a painkiller. Note: Quanah was prescribed Doxycycline for Ehrlichiosis and I’ve since read that this antibiotic, in testing, has shown to slow down the progression of arthritis. Monday, August 2 – Update on Quanah’s TTA surgery. After the last update, Quanah was not healing as expected. I was concerned that she was not improving and took her for x-rays. After reading the x-rays, the surgeon determined that there was a fracture at the site which at that point was healing and the plate had moved. It was decided to treat Quanah with painkillers and watch for improvement. Seeing no change, and noticing that her abdomen was abnormal, my vet aspirated the area and removed fluid with traces of blood. So it was back to the hospital. After tests, it was discovered that Quanah’s spleen was twisted and necrotic. She underwent an emergency splenectomy. I’m happy to report that although Quanah will never enter any races and will never be 100% on her back legs, I do see improvement. The surgeon also informed me that Quanah’s other knee had grown more bone, stabilizing it at this time. Hopefully there will be no further deterioration for a long time. September 28, 2010 – Update on Quanah – For the first time in months, 2 weeks ago Quanah actually ran through the garden for a very short time. While it has taken many months to improve due to her severe arthritis, she is doing very well now. Quanah has days when her knees may be a bit painful, but rest and a painkiller do the trick. She will be taking her daily glucosamine/chondroitin tablets for life. After reading about green-lipped mussel from Australia, I’ve included it in her regimen and I believe it has contributed to her improvement. The top 2 xrays are before surgery. The bottom 2 show the area after surgery.